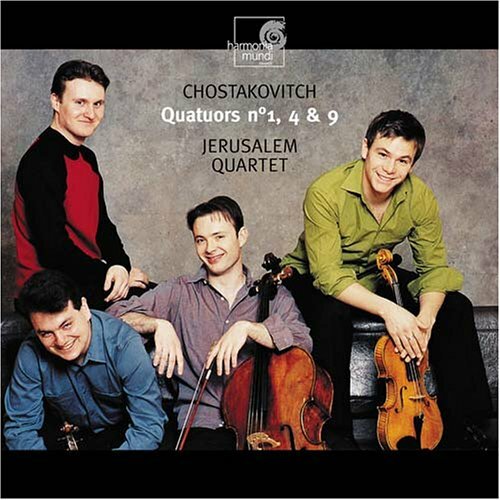 Ever since hearing the first recording and live performances of Shostakovich Quartets by the young Jerusalem Quartet (3/4 of Russian descent) I have thought them the most promising quartet of its generation in Shostakovich: Their's is Shostakovich in heat, played with great idiomatic and musical understanding - in short: stunning. Their first release (Nos. 1, 4 & 9 - HMU 901865) is among the very best single discs of Shostakovich quartets available, their second only furthers that assessment. Seeing quartet No.1 on their earlier disc should not scare anyone away as a possible piece of modestly inspired DSCH-juvenilia. There are, in fact, no "early" quartets and although just a test-run with the format, it's one of his finest. He must have realized that he got along very well with the format... as 14 others - many of them masterpieces - followed. Quartet No.4 in D-Major, op.83, with its long pedal points underneath a firm pulse, its beautifully orchestral and melodic second movement, the subtle nervousness and two gently irresistible pulses tip-toe-galloping over more open string pedal points of the Allegretto third movement, all before cumulating in the pizzicato-heavy Allegretto finale is performed with the technical wizardry expected these days, and the emotional investment so rarely heard anymore. The same goes for the other two works here. If the first disc is made up of more or less upbeat and joyously exciting works, the coupling of Quartet No.6, op.101, the great No.8, op.110, and No.11, op.122 (HMU 901953) has an altogether darker, more somber hue. 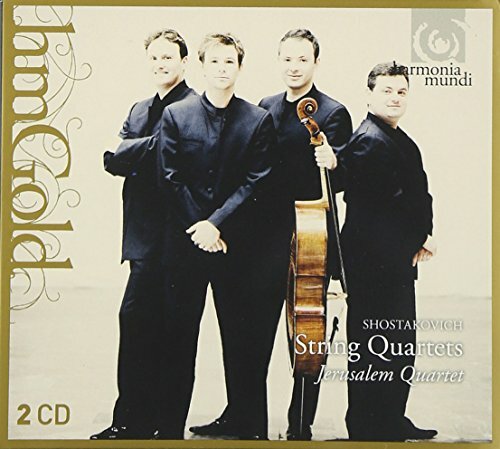 But the strengths of the Jerusalem Quartet come out in these works just as much. From the Allegretto of op.101 to the Finale - Moderato of op.122, they give a riveting account that is haunting in its painful moods, biting in its irony, irresistible in its drive. Especially in Quartet No.8, where the cool perfection of the Emerson Quartet (DG 638802) the Hagen Quartett (DG 650502) work best, the Jerusalem Quartet shows an alternative that is equally dark - but gripping instead of offering a sense of détaché. Their vigor in the second movement (Allegro) is almost frightening, the haunting ´fanfare´ of the first violin in the Allegro, bone-chilling. The cynical wit and dark humor of op.122 is combined with a compelling forward movement as the Jerusalem Quartet saws away on their instruments, unstoppably buzzing and twitching away. The delicacy in the third and fourth movements of op.101 is touching like I have not heard before - the transition from Lento to Lento gently indulging in music that, although in need of getting used to for newcomers, can´t fail to touch. If there is a group - on disc - that can please as much as the Borodin's first two cycles do, this is it. 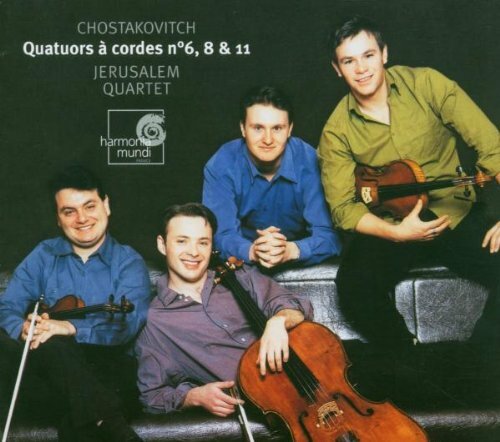 And amid the plethora of complete Shostakovich cycles that has come on the market over the last ten years, this quartet is one I actively wish will throw their hat in the ring! Both releases are very highly recommended.